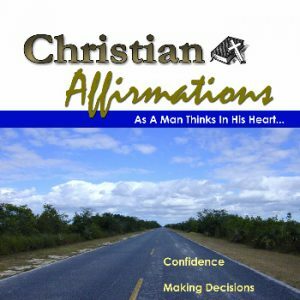 The Building Confidence & Making Right Decisions Christian Affirmation CD includes an introduction, optional relaxation exercise, and two sets of affirmations and scriptures read to uplifting music. Play affirmations while driving, working, cleaning, and relaxing. Timid, shy, lack self-confidence or afraid to take risks? You were created in the image of God and nothing is impossible to him who believes. Let God’s word and these faith based affirmations build your confidence to accomplish great things in God. The Holy Spirit empowers me with supernatural strength, wisdom, and courage. The Holy Spirit tell me what to say at the right time. God works in me and helps me with everything I do.